Fire and bombs have been exchanged between Israel and the Gaza Strip (image) for about a month now. The two have currently stopped fighting and are trying to work out a truce. The Gaza Strip is a small piece of land along the Mediterranean Sea between Israel and Egypt. Israel controls most of the area’s borders, and restricts who and what goes in and out. This limits the supplies to the Palestinians living in Gaza, and makes their lives difficult. Some people living in the Gaza Strip keep throwing rockets into Israel hurting its citizens and towns. In July, Israel started a military operation to destroy the weapons and rocket-launching capability in the Gaza Strip, and in retaliation, the rockets launched from the Gaza Strip went up. Most Palestinians live in two areas called the Gaza Strip and the West Bank (image), often referred to as “Palestinian Territories”. The status of these two areas is contested. The Palestinians have been trying to have the world recognize the Gaza Strip and West Bank as their independent country, while the Israelis consider the areas as territories under their country. For centuries, the Jewish and Palestinian people have both lived in the same geographical region. Today, the area is called Israel, but it was also called Palestine in the past. The region is “home” for both sets of people, and they have strong disagreements about who should get to live where. In 1947, the United Nations proposed splitting the area into two regions – one for the Jewish people and one for Palestinians. They didn’t agree, and fighting broke out. By the time the initial fighting was over in 1948, the Jewish people had created a country called Israel. This was followed by a war between Israel and some Arab countries (Jordan, Egypt, and more). The war ended in 1949 but by then, many Palestinian people had fled to two areas. One was called the Gaza Strip, which borders Israel and Egypt, and was under Egyptian control. The other was called West Bank, which borders Israel and Jordan, and was under Jordan’s control. In 1967, there was another war between Israel and some Arab countries, including both Jordan and Egypt. At the end of the war, which lasted for 6 days, Israel took over both the Gaza Strip and West Bank. In the 1990s, agreements were signed by the Palestinian and Israeli leaders giving some control of the Gaza Strip and West Bank to the Palestinian people. Since then, the two groups have been trying to figure out how to split the land to create the country of Palestine. 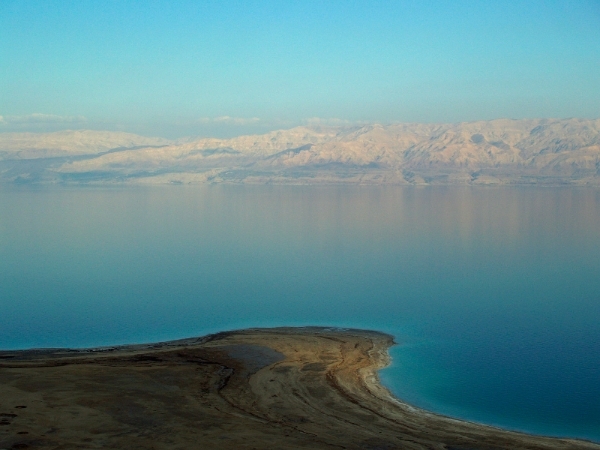 The lowest point on Earth not covered with water is the shore of the Dead Sea (image) which borders Israel, West Bank, and Jordan. It is about 1,300 feet (400 meters) below sea level. The Dead Sea’s salt content is so high that you can lay on the surface of the water and float without even trying to float. Here is a video about the Dead Sea.